Disclosure: I was sent a DVD to facilitate my review. The views expressed in this post are my own. Affiliate links are included in this post. I’m a collector of movies. I love receiving movies as gifts. I search Facebook yard sale groups. I can’t pass a movie display at a store without buying something. One of the perks of blogging is that I get sent movies to review. How awesome is that? Another perk? I get to share movies with you, my readers! I have stacks and stacks of movies. A treasured part of my collection are classic kids’ movies. I love collecting classic Disney movies…Aladdin, Snow White, Sleeping Beauty, and more. I adore sharing these classic Disney movies with my family. Though we watch many, many movies at our Family Movie Nights, there are some Disney movie titles that are hard to find. These classic movies are rarely released. 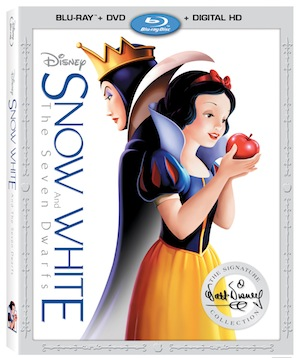 Recently, Disney released a classic…Snow White And The Seven Dwarfs on Blu-ray and Digital HD. Snow White And The Seven Dwarfs embodies The Walt Disney Signature Collection’s legacy of animation. In this epic story of love and friendship, the kind and beautiful princess Snow White wins the hearts of the Seven Dwarfs and triumphs over the evil plans of a wicked Queen. Snow White And The Seven Dwarfs called “The Greatest Animated Film Of All Time” is now available on Blu-ray ($36.99 with DVD and Digital HD) and Digital HD through Disney Movies Anywhere, and other movie sites for $19.99.